When I set blackcurrants as this month’s We Should Cocoa challenge, I had vague thoughts of making my mother’s Blackcurrant Buckle recipe. Neither of us have actually made this in more years than I care to remember, but it has lived on in my memory as a good one. A bit of adaptation in my usual way to include chocolate would have been a cinch. However, although I remembered to raid my mother’s blackcurrant bushes on my last visit there, I sadly forgot to raid her pile of recipe scraps for the neglected Buckle. All was by no means lost however, I did have something else in mind – two in fact. One of the many surprise presents I received from CT on my birthday was a copy of Biscuits by Miranda Gore Brown, she of Great British Bake Off fame (1st series). This now sits in pride of place on my bedside table and forms my bedtime reading, giving me plenty of sweet things to dream about. When I first looked at the book, it just happened to open randomly on a recipe for blackcurrant and white chocolate biscuits – well really, how could I ignore that sign? The other idea I had was for ice-cream and frankly, that could wait for another day. I only made half the quantity given and just as well. Miranda’s recipe was for 16 biscuits. All I can say is, I’d be delighted to be invited around to her house for tea; my half amount produced 15 large biscuits – I can only assume hers are absolutely ginormous. Other than rounding up the odd measures that halving the recipe entailed, I reduced the sugar slightly and used my usual half wholemeal flour mix. Creamed 115g unsalted butter with 100g cardamom sugar (caster) until very light and fluffy. Beat in about 80g condensed milk. Mixed in 175g self-raising flour (half wholemeal, half white). As mixture was a little stiff, added a tbsp of milk. Mixed in 75g chopped white chocolate (G&B). Carefully mixed in 90g blackcurrants. Placed 15 large dollops on a tray covered with a silicone mat and baked at 180C for 10 minutes at which point the biscuits were golden and crisp around the edges. Left on the tray for ten minutes then transferred to a wire rack to cool completely. These were crisp on the outside, soft and chewy on the inside and were what I would term cookies rather than biscuits. They spread more than I anticipated, so most of them merged into each other, which was a bit annoying. Oh, but they tasted good! Sweet biscuits with little caramely bites of white chocolate which contrasted with bursts of tart juicy berries giving a great taste sensation. Alpha Bakes – a monthly challenge run by The More Than Occasional Baker and Caroline Makes. The randomly generated number this month comes from Caroline and is W for White chocolate. Made with Love Mondays – a weekly challenge set by Javelin Warrior’s Cookin w/Luv to make something completely from scratch. Bookmarked Recipes – a monthly challenge run by Jac of Tinned Tomatoes, but originally created by Ruth’s Kitchen Experiments to make something you’ve bookmarked from a book, magazine or online. These look lovely! I think the hint of cardamom sounds like a great addition. Thanks Alicia. A hint of cardamom seems to go well with most fruit. What would we do without mothers? Other than flapjacks, I’ve never used condensed milk in biscuits before so it was fun to see how they would turn out – delicious of course! Thanks Ellen – I hope the Nonnettes work out for you both – I’m a real fan. These look really good, definitely more cookie than biscuit! Our blackcurrant bush has a grand total of one green sick looking blackcurrant on it so I am very jealous of your plundered berries! Oh dear Hannah, that doesn’t sound good. It’s not a great year for very much though – other than slugs! CC, I think this is an excellent use for them. I shall be baking these biscuits again. Hee hee, it wouldn’t be much of a chocolate blog if I didn’t use that most crucial of ingredients JW! Blackcurrants like a cool climate, but I’m sure you could find them in some form or other. Mmm…. they do look good. They seem crunchy and yummy to me! And blackcurrants are great in cakes and biscuits. Well done Choclette. Thanks Alida – delicious they were, but sadly all gone now. They sound utterly amazing. I was thinking of pairing white chocolate with blackcurrants too – the sharpness of the berries and the sweetness of the chocolate ought to work really well. It’s ages since I’ve had a good biscuit/cookie and these look great! You’re absolutely right C, this combination is a really good one for the reasons you stated. I’ve used it in ice cream too where it also worked brilliantly. They sound and look absolutely delicious Choclette! I love the idea of pairing sweet white chocolate and tart blackcurrants. Thanks Jo, it’s an excellent combination. Blackcurrant and white chocolate sounds like a match made in heaven. Very keen to get my hands on Miranda’s book, it sounds fab, even if her portions are slightly out of control! It’s a great combination and a book and I’ve been enjoying reading it before going to bed AND then dreaming of biscuits all night!!! Thanks Corrie. Fruit is a great way to counteract the sweetness and richness of pastries. These sound great, would love to make them to take to work! I’ve made blackcurrant flapjacks for work before and they’ve always been a big success. they look wonderful. I do love a fruity biscuit… bet these were divine slightly warm and a little cakey… I am stumped to what I should do this month… I though I had an idea but not entirely sure… it’s my mums birthday this coming weekend so it could be as simple as a chocolate victoria sponge with blackcurrant jam! Lovely combination of flavours. I like the idea of a bit of a sweet and sour combination in a biscuit. Thanks Phil, I think it works wonderfully well, but the sort of think I didn’t desperately appreciate when I was little. Very clever to come up with something that fits so many challenges. I’ve come up with a recipe that uses similar ingredients to yours but in dessert form. Fab entry for Simple and in Season. Thanks Fleur – I just got lucky with this one. My aim now is to do six! These look brilliant – and huge considering they’re half the original size! Hope you strike lucky Nat. Don’t you have any next door neighbour gardens you could raid? Those cookies looks wonderful, i haven’t tried cookies with condensed milk and cardamon sounds very interesting! Thanks for the comment, i’m a long holiday in India enjoying with my family, though post doctorate position is in pipeline, i’m planning to spend bit more time with family 🙂 happy summer to you! I know Celia, I was quite pleased to have only made half the amount. Though I guess I could always have frozen the other half – now there’s an idea! These look lovely, love that crispy outside, chewy inside stylee cookie. Thanks Janice. Texture and flavour contrast made these very special. Must remember them for next year. Wow brilliant challenge recipe – I’ll have to pass the challenge queen title to you 😉 Love the sound of these cookies. Thanks for entering them to AlphaBakes! Hee hee Ros. This is the 2nd time I’ve managed five – need to try for six next time! Having just returned with 7lbs of blackcurrants picked from a very kind friend’s garden and made all the jam/jelly I need this seems an excellent way to use the remainder! Picking 7 lbs of blackcurrants sounds like a labour of love, they are not the easiest fruit to pick. 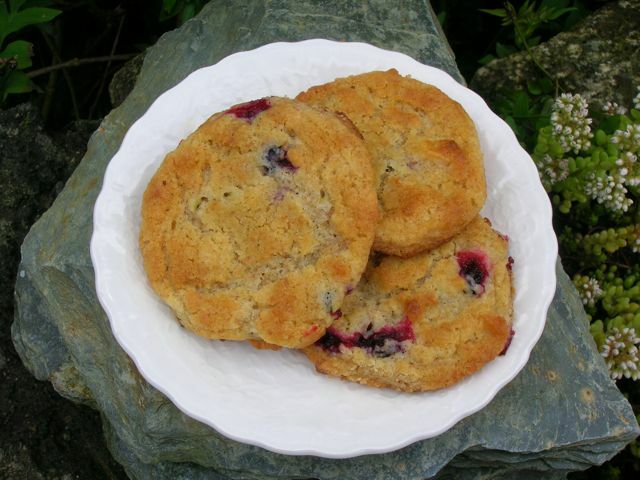 These biscuits are good, but so is the Blackcurrant ice-cream I’ve also made. Will be blogging about that soon. Hi I am dropping by via AlphaBakes. What a lot of delicious looking cookies. I love the idea of combining blackcurrants and white chocolate. Is the self-raising flour, 87.5g of wholemeal self-raising flour and 87.5g plain self-raising flour making a total of 175g? Hi Amy. Yes it’s 175g in total. I wouldn’t worry about being exact 90g of one and 85g of another should be fine. Would love to see a photo and hear how you got on if you do make them.